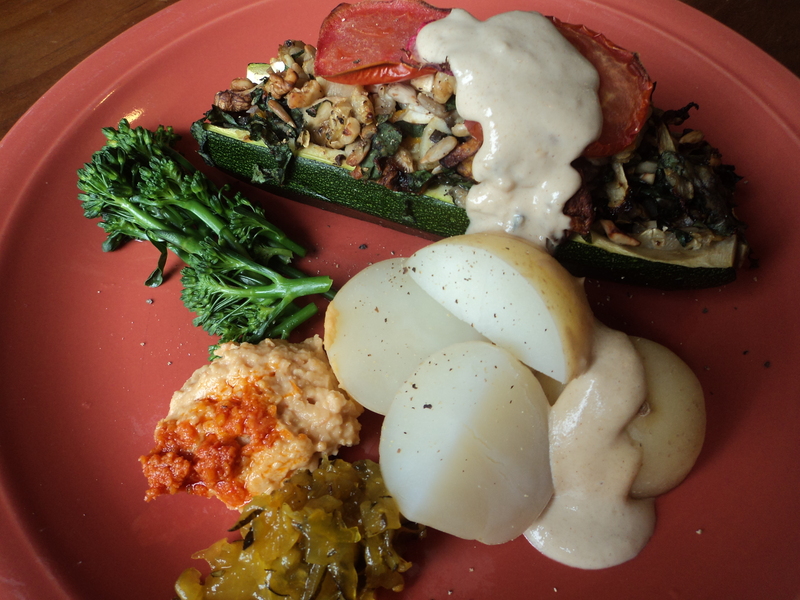 Inexpensive, hearty, homestyle cooking that is low in sugar, low in fat, sometimes raw and always vegan. 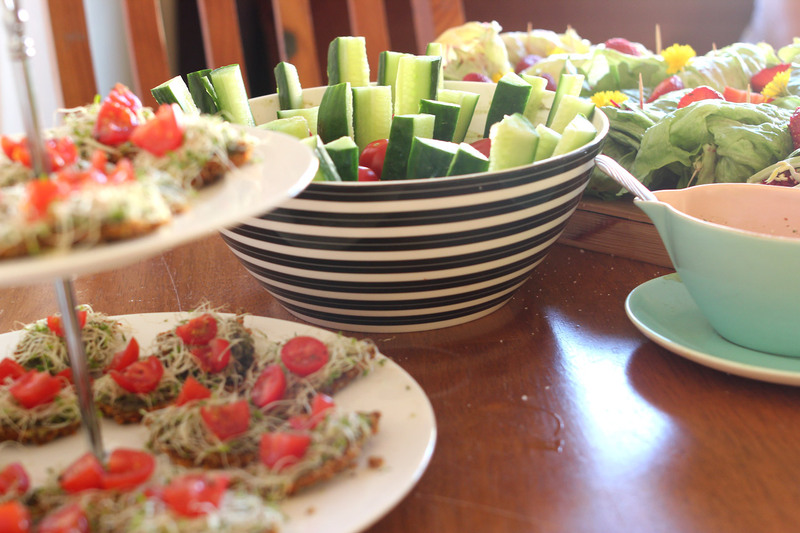 I held a party and the food looks pretty simple – in fact it just looks like salad – but it wasn’t. The flavours were lovely and each dish was incredibly simple to prepare. 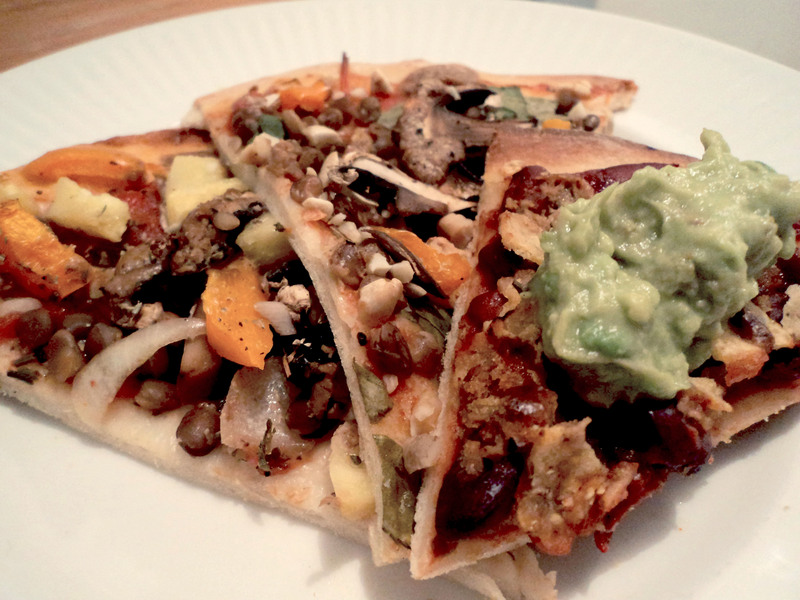 So this is my dinner-party turbo blog. Enjoy! 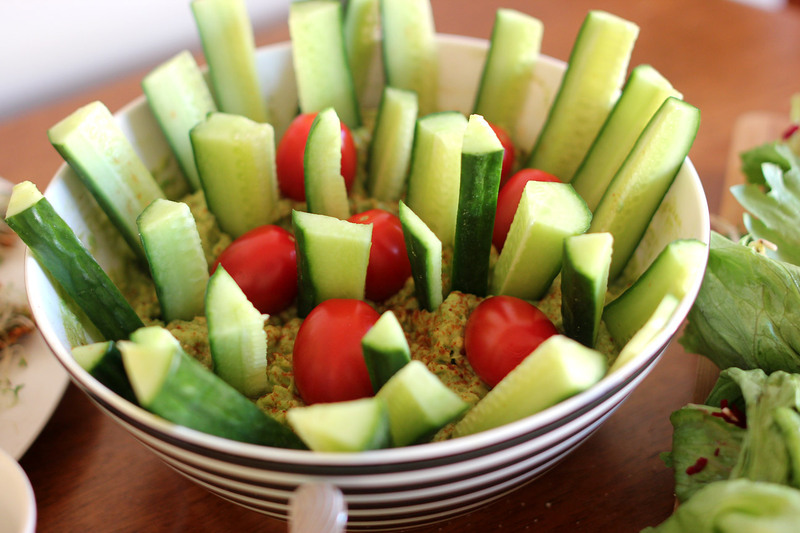 Raw food is very quick to make and has speedy clean up time. We made this in approximately 2 hours other than the bread which took 10 minutes preparation time and just 2 hours to dehydrate. People left feeling satisfied, but with no digestive burden. 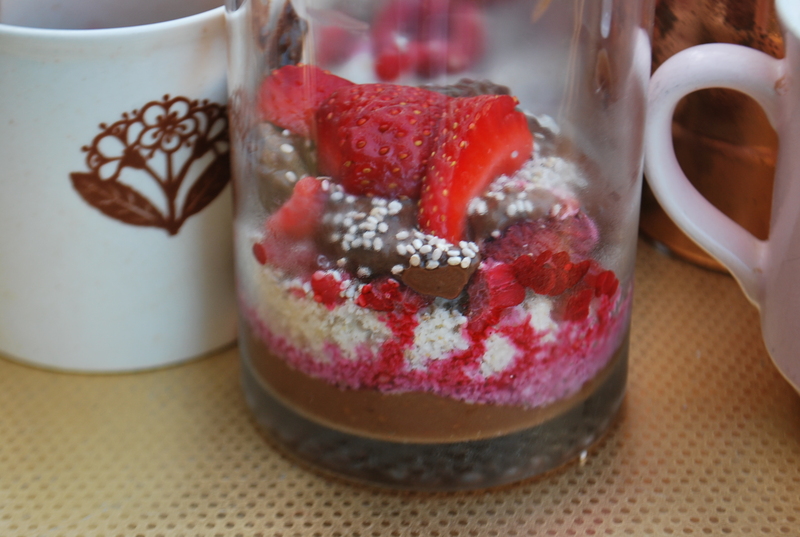 Chocolate parfait – what’s nice about this is that the layer of nuts and seeds becomes kind of cakey when the coconut cream drizzles through. Tahini-banana dessert… incredibly simple preparation – 5 minutes – absolutely delightful result. Taste as you go and adjust to taste. Recipe can be found here. This time made with maple. Super simple: avocados, garlic, lemon, salt, pepper, cayenne pepper. You can also throw in sundried tomatoes. Dough: In a food processor blend 125g LSA, two handfuls sunflower seeds, 3/4 of an unpeeled carrot, enough water to make a dough and salt generously taste. Press flat onto your dehydrater and dehydrate until desired consistency achieved (flipping half-way through the process). Top with basil pesto: pulse 70g of cashew nuts in a food processor until powdery, add half a dry basil plant including stalks and blend, drizzle in oil until it is no longer a dough. Taste as you go to ensure you have the right oil balance, salt generously to taste; will last for a long time in the fridge. 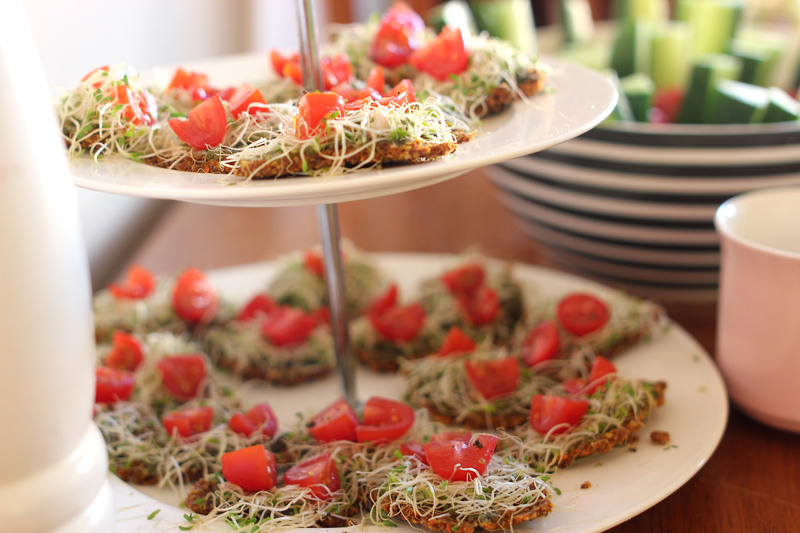 Finish with alfalfa sprouts, chopped baby tomatoes and salt and pepper. You can even put a little cashew cheese on there if you like. This is my favourite bread recipe. In large lettuce leaves wrap; mung bean sprouts, capsicum, cucumber, beetroot, coriander and sunflower seeds, salt lightly. 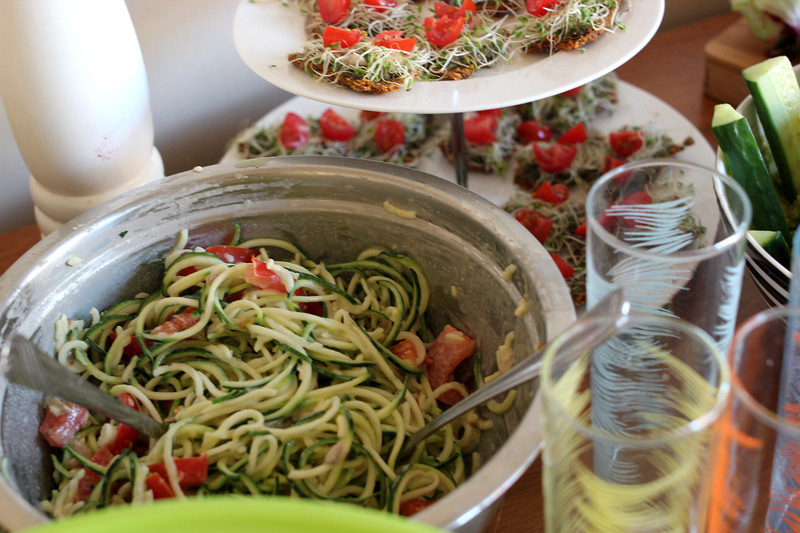 Spiralise zucchini/courgette into noodles. 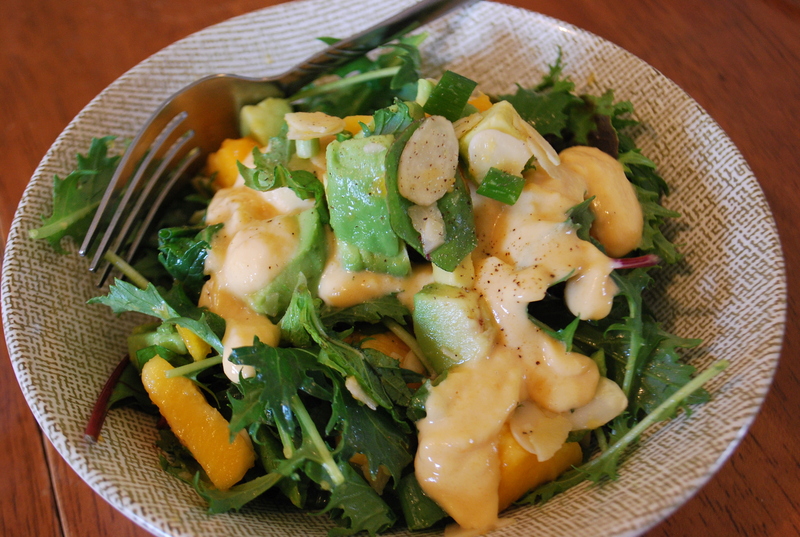 Make a dressing from tahini, coconut milk, lemon juice and salt. Add sunflower seeds and fresh tomato. Simply blend 2 bananas with 3 dessert spoons of tahini. Add water slowly while blending to achieve desired consistency. 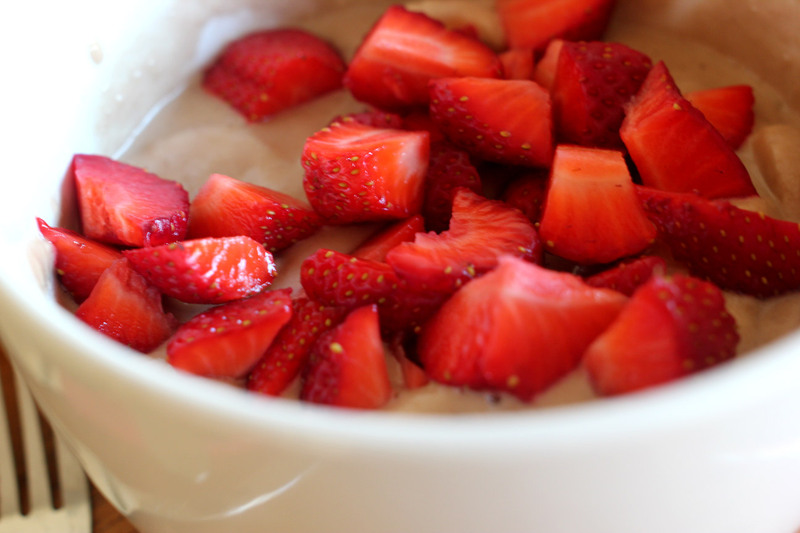 Mix in chopped strawberries and banana. What you can’t see is the lemonade: fresh lemon, a little maple, water. A second jug was made by soaking a pomegranate and berry teabag in the lemonade. Beautiful! Let me eat you 1000 times! Grate carrot and beet, toss some pumpkin seeds through. 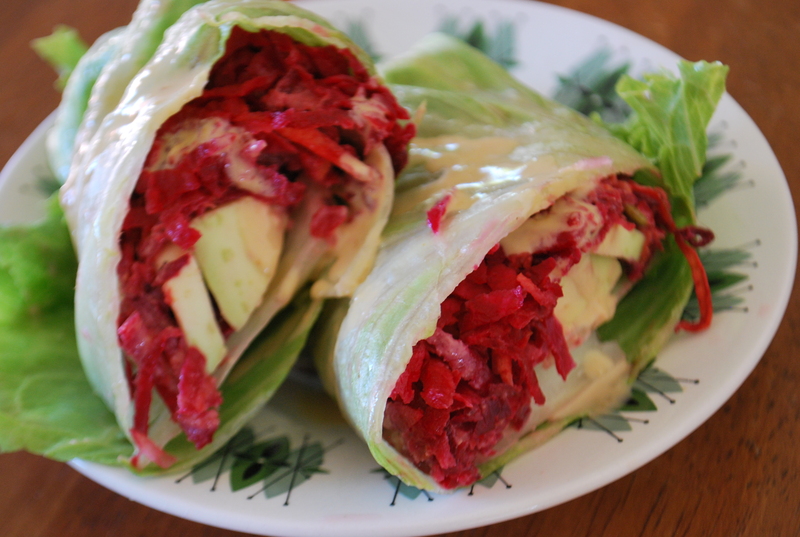 Assemble beet-blend in the centre of a lettuce leaf, along with a few slices of avocado. 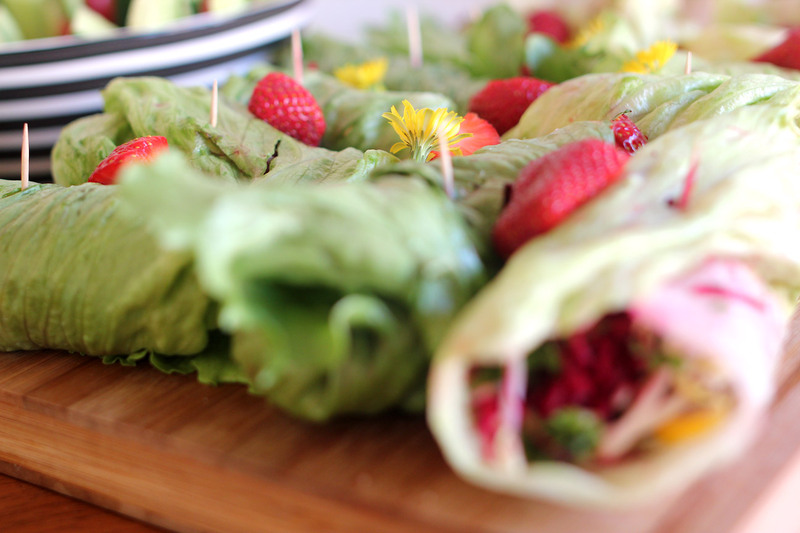 Drizzle with Miso-tahini Dressing, and roll the leaf folding the stalky side in first. You might want to fold the tops down first so it’s like a wee package, but really, your rolling style is up to you. When living in Costa Rica, I used to walk up the road every day and enjoy a salad bowl from a local restaurant. They poured this, over a dull green salad with sliced capsicum, avocado and macadamia nuts. It was incredible. I ate it almost every day for a year. The picture can’t explain how it tastes, but once you make this once you’ll want to live off it. It takes around 30 seconds to make. 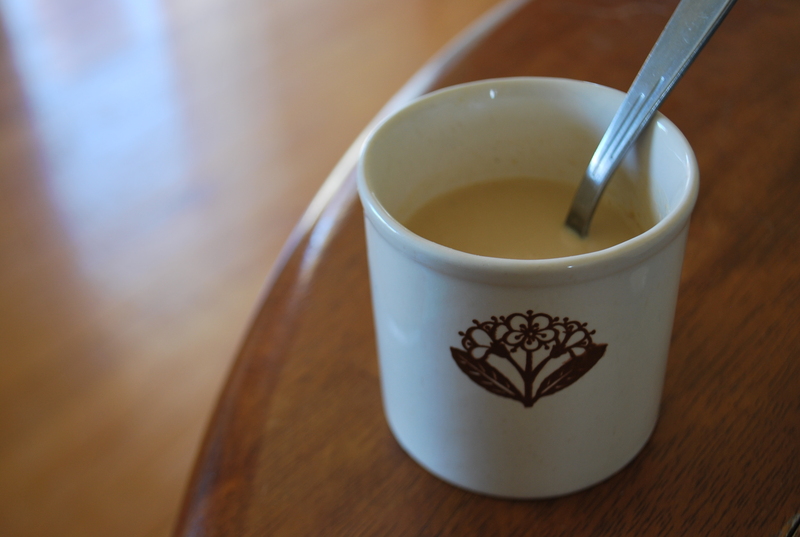 Mix tahini, lemon and white miso. Slowly drizzle in water until you reach the desired consistency. Drizzle frivolously atop everything. This simple salad is inspired by my Mum. 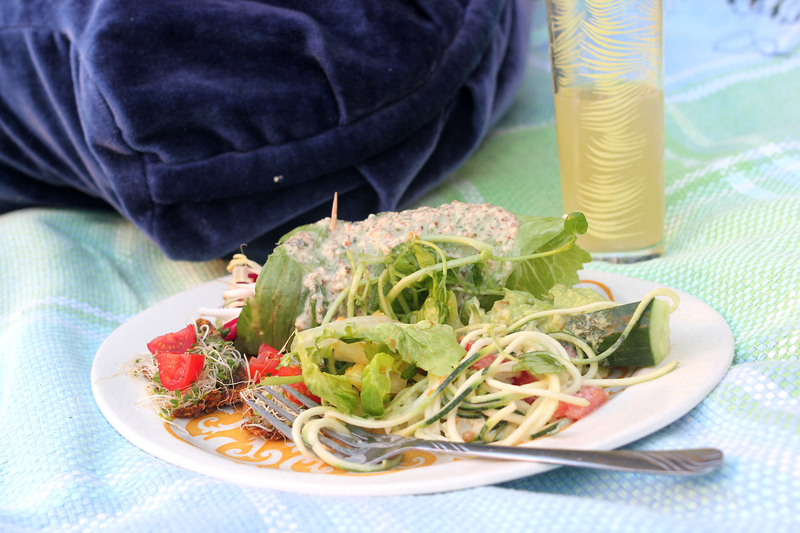 Chop avocado, spring onion, mint, papaya and assemble with almonds on salad greens. In a food processor, blend 2 teaspoons of tahini, with chunks of chopped papaya, add in water to offer a pourable consistency, and a dash of lemon (to taste) to peak the flavour. Drizzle dressing on salad and top with salt and pepper. Marrow are juicy, oversized, courgette (or zucchini in the US); they’re lovely. What I love about this summer fruit is that you can stuff them with almost anything and bang out a passable meal. I like to use up the bits around the kitchen and garden. It’s nice idea to include some nuts and seeds – for a protein punch – and serve them dripping in tahini sauce. This one is stuffed with leftover pumpkin, silverbeet, cashew, walnut, sunflower seeds and garlic, then topped with tomato and radish. But you can put whatever you want in them; consider mushrooms, onion, sun dried tomatoes, quinoa or olives, or go the rice-curry powder-sultana route. I scoop out the insides, chop them up, blend them with whatever, stuff it all back into the marrow and bake it until brown. I top the meal off with other vegetables and a side of hummus, a red pesto or maybe a little sweet pickle. This is a beautiful gluten-free meal. 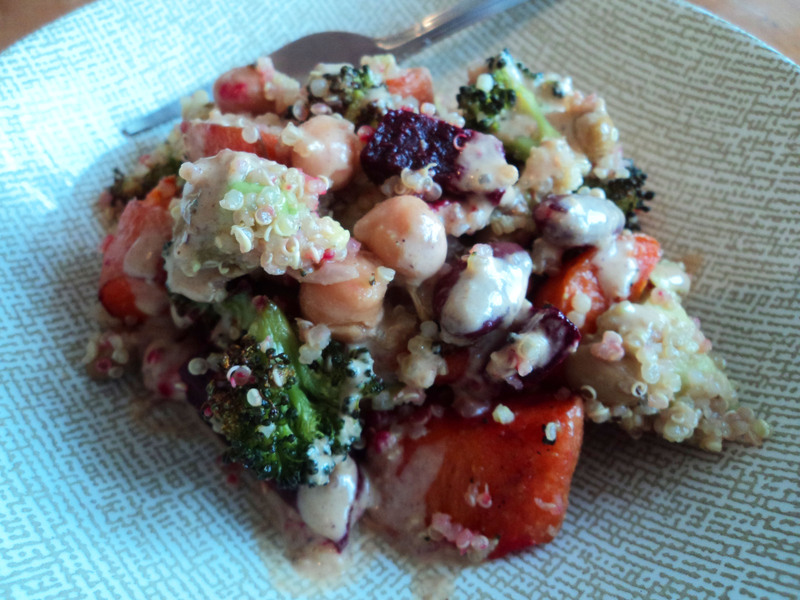 Simple, healthful, hearty and delicious. Serve smothered in Tahini Sauce. Or alongside a spinach salad, with a balsamic dressing. I mean tortillas with refried beans, vegetables and avocado. Es muy similar a un quesadilla. It’s very similar to a quesadilla. This takes me back to my days living in Costa Rica. Yes, that’s me showing off. You really need salsa or fresh, chopped tomato on top of this. I ran out of tomatoes – make sure you don’t. Es muy delicioso, mis amigos. Me debes para ello! Sorry for my dreadful Español but in my mind it lends to the authentic flavour. Add a little drop of oil to a pan and fry thinly sliced potato, thinly sliced tomato, thinly sliced onion and garlic, along with chopped capsicum and mushroom. Stir and cook until potato is cooked through – set aside and wash pan. 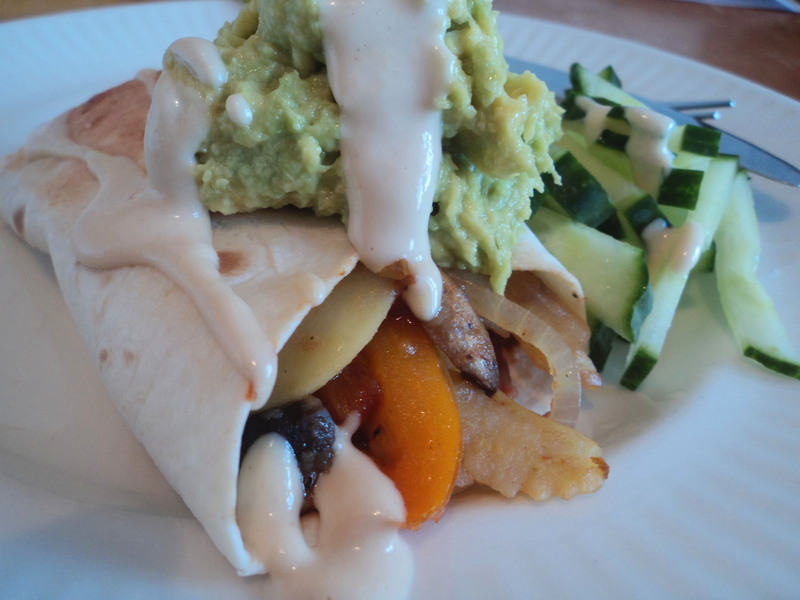 Then in the centre of the tortilla add a strip of refried beans and top with the vegetable mix. Fold each side in and set with folded edges to the base of the pan. Lightly fry until golden, then flip. Serve with mashed avocado, chopped cucumber, tahini sauce and freshly chopped tomato or salsa. You can refrigerate the beans, vegetables and sauce and whip up extra ones for a snack, when desired. My boyfriend has an insatiable lust for food. His voracious appetite has never been satisfied – until tonight. Because tonight, I made four pizzas and they ruined him. He seems to have slipped into a food coma. Moments ago I nudged him with my foot and his body appeared lifeless. I’m uncertain if he’ll recover – but that’s irrelevant! The most important thing is, I won. Bread maker – combine all ingredients, set bread maker to make dough. In bowl – combine all ingredients (mix well), set in warm place for 2 hours until risen. Once risen, you will be able to make two large, three medium-sized or four smaller pizzas with this; it’s a generous recipe. Cut the dough into sections, sprinkle surface with flour and roll each out. Before topping your pizza blind-bake each base. Pop each in a hot oven for 5-10 minutes until the base puffs up a little. Pull it out, smooth it down, then top. For the pizza sauce mix tomato relish with chopped tomatoes, but drain most of the juice away first. Top with mushrooms, drained brown lentils (from a tin), cashew nuts, capsicum and spinach then drizzle generously with thinned tahini sauce and sprinkle with crushed pepper. For the pizza sauce mix drained, chopped tomatoes, garlic, onion, mixed herbs and tomato paste. Top with mushrooms, pineapple, capsicum, drained brown lentils (from a tin), drizzle generously with thinned tahini sauce and then sprinkle with crushed pepper. For the pizza sauce mix chili-beans, red kidney beans and drained, chopped tomatoes, sprinkle crunched corned chips atop, along with thinned tahini sauce then serve, once cooked, with home-made guacamole. 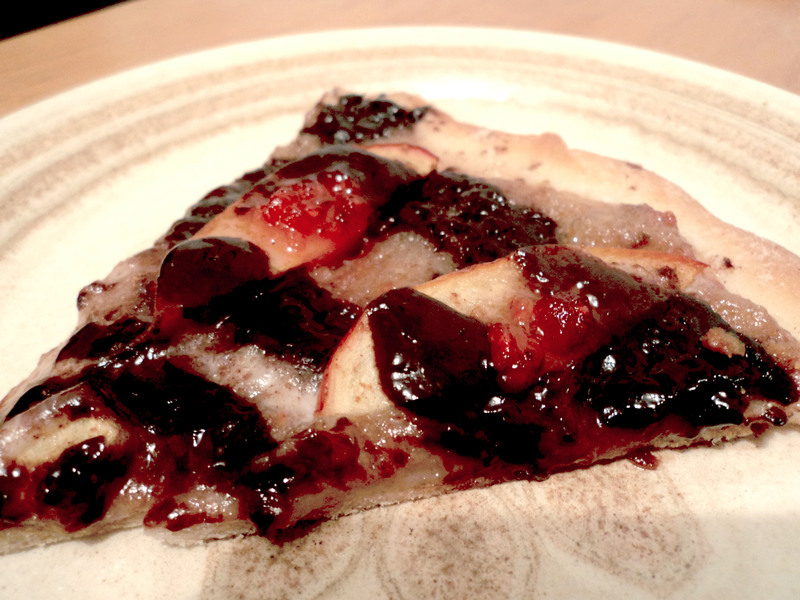 For the pizza sauce, blend two bananas (you can use frozen ones – once defrosted – but be sure to drain away excess moisture), with 2 teaspoons of raspberry jam and a teaspoon of vanilla. Top with nectarine, swirls of coconut cream, coconut cream melted with squares of dark vegan chocolate, dollops of raspberry jam and then sprinkle generously with cinnamon and icing sugar (otherwise known as confectioners or powdered sugar). Bake each pizza until golden, serve while warm. I’ve been on holiday, but return with delicious stuffed marrow. This was created by myself and Vegan Pirate at Jodi’s place. I have to mention Jodi so she feels included, but creative credit goes to us. Marrow are giant courgette, or, if you live in the US they’re giant zucchini. When in season you can pick up a marrow for just $1. 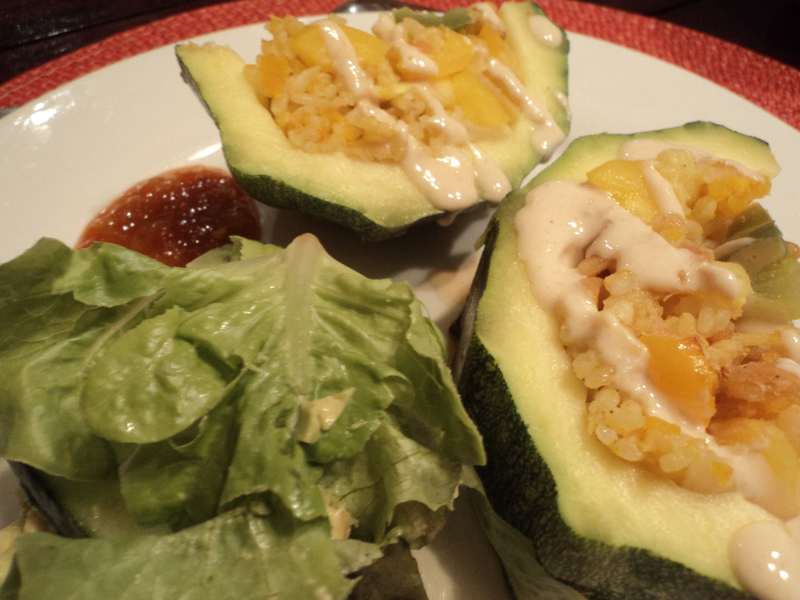 Cook rice, but add vegetable stock to the water (a rice cooker is ideal for this). Scoop out the insides of the marrow, chop and set aside. Cook pumpkin in microwave, remove skins and mash. Now construct the stuffing. In a frying pan, cook garlic and onion until transparent. Then add two handfuls of the inside of the marrow (more for a large marrow), chopped capsicum, peanuts, pumpkin and 1 cup of cooked rice (more for a large marrow), then fry. Salt to taste. Once cooked press the stuffing into the marrow and pile on top. Press stuffing into a rounded shape and drizzle with tahini sauce, then sprinkle with pepper. Bake until the marrow is al dente, and test it with a knife). 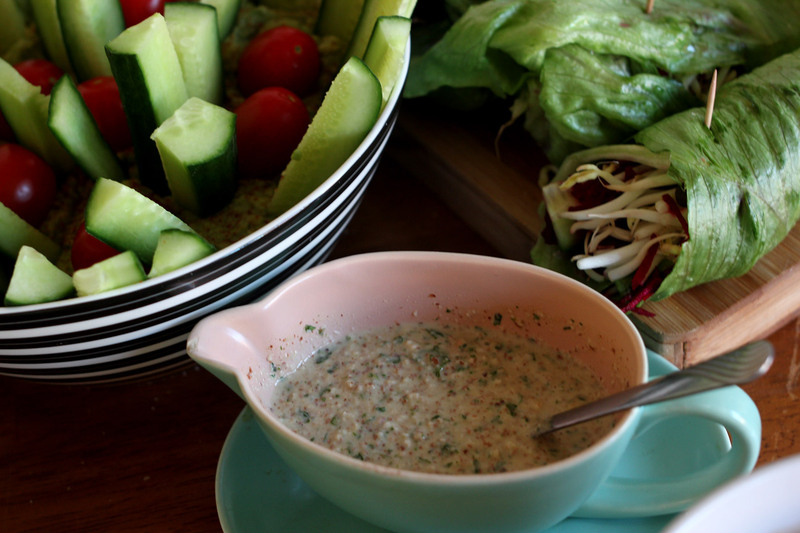 Serve with tahini sauce, relish and a side salad. 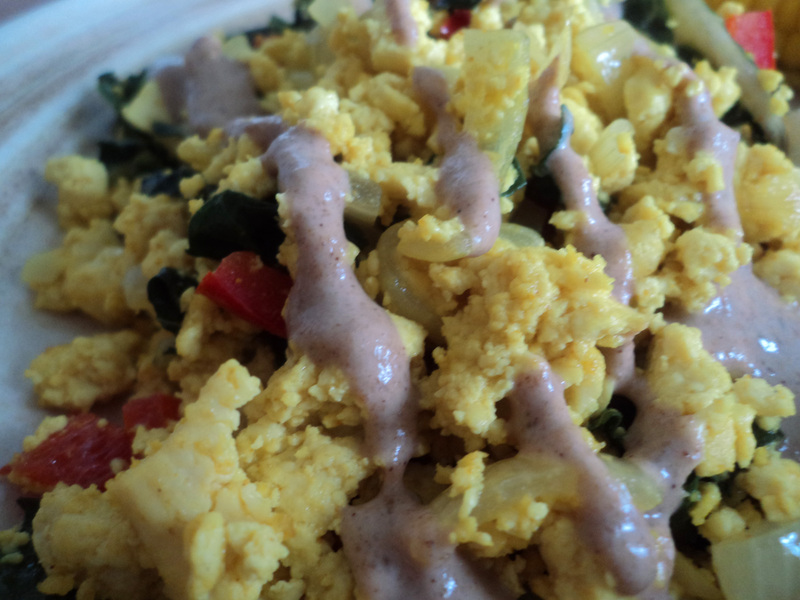 Don’t be afraid, it’s tofu – tofu scramble. This is my first demystifying tofu post. I feel like it’s time to celebrate with my favourite recipe, because yesterday I had 286 people reading my blog! This is the best scramble recipe I’ve made. I enjoy serving it with home-made hash browns, and smothered in tahini sauce. All tofu was not created equal, and this causes people a lot of confusion, because of this I was for five years a dedicated tofu hater. Not anymore! For this recipe you want to get a very firm tofu – but beware! Some boxed tofu brands call themselves “firm”, but they are not. You do not want boxed tofu. You want to get the tofu from the chiller, inspect it and press it. It should be almost rubbery to the touch – think chewy. This is the zone you want to occupy. It won’t taste weird, it’s OK.
You can add a number of vegetables to this impressive dish, and if you do it right you’ll crave it in weeks to come. I ran out of lime so thanks to subscriber, Brooke No Nonsense, I made tahini using apple-cider vinegar. Any of the following vegetables; chopped capsicum/red bell pepper, chopped spinach, chopped kale or sliced mushrooms. Fry chopped onion and garlic in oil, crumble tofu with fingers and add all remaining ingredients. Fry until all vegetables and onion are cooked. Salt to taste and serve with tahini sauce (tahini whipped with apple-cider vinegar and water), and either baked beans, toast, hash browns or any other delicious breakfast food. Thanks for all the support and positive messages! The Ultimate Most Perfect, Inexpensive, Quick Vegan Ice Cream Base Recipe; Scoops From The Freezer Like A Dream. Life Will Never Be The Same! Aah! It’s A Frisky Summer; Mango, Watermelon, Tofu Salad!